There are no psychological forces, no dual reality, no swami, no sleights, of course, no stooges or instant stooges, no preshow, no math, no memory and no stack. Unlike any other ACAAN, this can be instantly repeated with a different outcome. 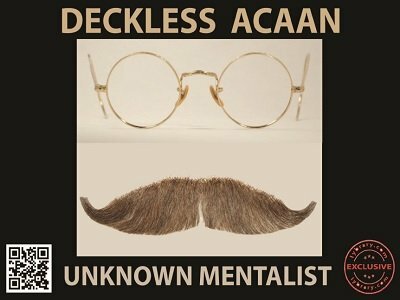 Routine 1 - Deckless ACAAN with Super Prediction - A participant randomly chooses a playing card. A second participant randomly chooses a number. A third participant tries to use her intuitive power to divine these 2 choices. She gets the card but misses the number. For the killer climax, the performer has predicted all these choices including by how much the third participant misses the number. No physical deck is used. Routine 2 - Deckless ACAAN with Exact Prediction - 2 participants randomly choose a card and a number. The performer has predicted both these exactly. No physical deck is used. Routine 3 - Perfect ACAAN with Hands off Deck - A sealed deck of cards is in full view right from the beginning. The performer never touches it. 2 participants randomly choose a card and a number. A third participant then opens the deck and deals the cards to find the chosen card at the chosen number. Routine 4 - Perfect ACAAN with Hands off Deck with Multiple Participants - A sealed deck. Performer never touches it. 2 sets of participants each choose a card and a number. Both the chosen cards are found to be at both their respective numbers. Routine 5 - Deckless ACANAB - Any card, any number, any back color - 3 participants each randomly choose a card, a number and a card back color. The performer's prediction is of course exact on all 3 counts. No physical deck is used. Routine 6 - Perfect ACANAB with Hands off Deck - A sealed deck in full view. Performer never touches it. 3 participants each choose a card, a number and a back color respectively. When the deck is opened the chosen card is found at the chosen number and it has the chosen color back which is different to the back color of the entire deck. Routine 7 - Deckless ACANACAB - Any card, any number, any celebrity, any back color - Well, you will have a lot of fun with this one. 1st edition 2017; 26 pages.